The male and female Robin are small brown birds with a bold red breast, fine bill and a dark eye. 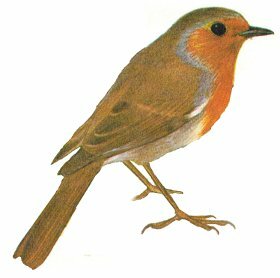 The red breast has an edging of bluish-grey which runs down the side of the neck and breast. Note the distinctive bright red breast with bluish-grey edging and the birds dark black eye, the Robin is an unmistakable bird. 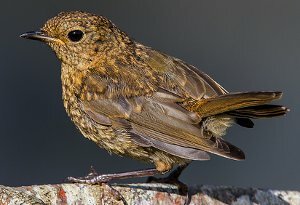 Juvenile Robins can cause some confusion, they lack any sign of a red breast and the head and breast can appear quite spotted with light buff feathers. Common resident breeder in most of Europe including the UK. Absent from Iceland and is a summer visitor to Northern Europe. A bird of woodland, gardens, parks and hedgerows. 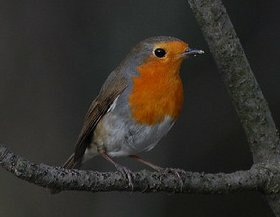 The Robin needs little introduction and is considered by most to be Britain's favorite bird, possibly due in some part to the Robins willingness to accept human presence in close proximity and often becoming very tame following gardeners for tidbits.